Dutch Beaumont M 1873 Navy rifle 11 mm. S# 2694 on crossguard. Excellent bright fullered yatagan blade. Ricasso is marked with a Dutch inspector mark Crown over B in a cartouche. (= Inspector A. N. Brossois ) Excellent brass hilt with long 72 mm spring secured with a large screw and old holes from former short spring filled with brass. Bright crossguard with fast forward swept quillon showing low serial number 2694. Muzzle ring MRD 17,5 mm. Excellent metal scabbard with typical hemispheric final and two rivets in top mount. No serial number on scabbard and no dents. This example is without a maker's name. We believe this example was a part of this very first batch. Later, after the conversion was done, a serial number must have been added. Only 5.400 Beaumont navy rifles and bayonets were made.This is the first bayonet pattern converted to the second pattern. 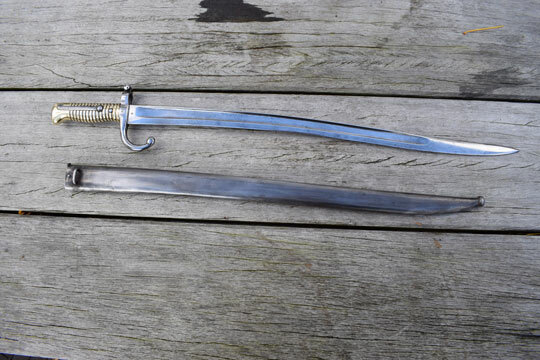 A very rare and interesting bayonet in an Excellent condition.